Transmission electron micrograph illustrating the 'classic' appearance of the nucleus in osmium tetroxide fixed material. 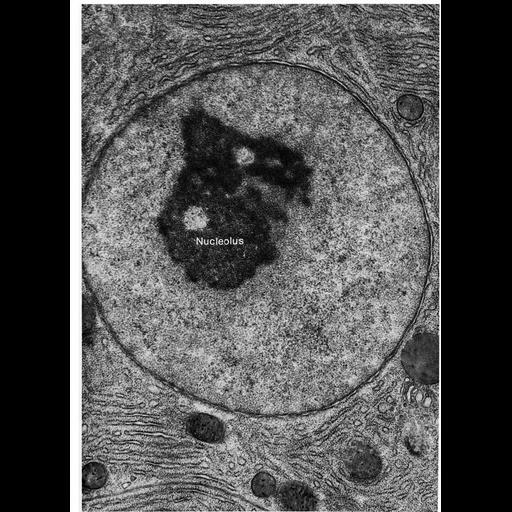 In this pancreatic acinar cell nucleus, the only prominent feature is the large nucleolus. Figure 112 from Chapter 4 (Nucleus) of 'The Cell, 2nd Ed.' by Don W. Fawcett M.D. A PDF copy of the corresponding chapter is available on the ASCB's BioEDUCATE website.